The Purpose Of This Welcome Guide This Guide is predominantly written BY students FOR students, therefore giving you an honest idea of what to expect while you continue to study as an MBChB student in year 3 and onwards. However, do bear in mind there can be changes to the programme from year to year and their experiences could differ to yours. You should also read The MBChB Programme Handbook, which is an important source of reference that you can refer to when you have query about the Programme. The Student Experience office coordinates the articles in this guide as they are written mainly by the Clinical Education Years Peer Mentors, Student Coordinators, other students and some principal staff. We hope you find lots of informative, helpful and valuable information within this guide to support you in your next step into your clinical education years. The first student guide was written in 2013 by Antony Sorial, a then Year 5 Medical Student at Salford, “As a student entering my Clinical Years I felt a huge transition, not only in my medical career, but also in my life. Becoming a student doctor is a challenging and difficult adjustment to make. My ambition was to find a way to help others learn from the mistakes I have made, and opportunities I have missed.” A taster of what to expect in this guide: Taken from the Article ‘That Transition into Clinical Education Years’ by Claudia Cipriano, Wythenshawe Year 3 Intercalating Student 2018 “Third year was a huge change but I loved it! I loved being in the hospital, talking to patients and seeing all the things we learnt about in real life. Some things will make you laugh, and some will make you want to cry but it gives you a true taste of what your future career will be like.” Using this guide: This guide can be read like any eBook where you can swipe across the screen to move from page to page or click on the right and left arrow if you are using a PC. There is also a contents page with the titles of each of the articles, which are article links. You can click on the names of the article to go straight to that article. We would recommend reading through the entire guide at 1st as there is lots of great information and then use the contents page links to refer back to specific articles. Contents The Purpose Of This Welcome Guide ..................................................................................................... 2 Year 3 Welcome Message from the Head of the Medical School .......................................................... 3 What happens in Year 3? ........................................................................................................................ 6 Learning The Lingo .................................................................................................................................. 7 Quotes from your Peer Mentors............................................................................................................. 9 MFT Wythenshawe – A Welcome From the current Dean ................................................................... 11 1. About Wythenshawe Hospital .............................................................................................................. 13 Life In A District General Hospital ......................................................................................................... 15 Macclesfield General Hospital .............................................................................................................. 16 Leighton Hospital, Crewe ...................................................................................................................... 18 Stepping Hill Hospital, Stockport .......................................................................................................... 20 Tameside General Hospital ................................................................................................................... 22 2. Top Tips For a Stress Free Portfolio ...................................................................................................... 24 What Is A Logbook? .............................................................................................................................. 25 What Are Themed Case Discussions (TCD)? ......................................................................................... 27 Secondary Component Teaching (SCT) ................................................................................................. 29 What is Clinical Debrief (CD)? ............................................................................................................... 30 What Are Prescribing Tasks? ................................................................................................................. 31 Clinical Skills ‘A Practical Tool Kit’ ......................................................................................................... 32 Top Tips For OSCE’s ............................................................................................................................... 34 Progress Test In Years 3-5 ..................................................................................................................... 36 What Are Applied Personal Excellent Paths (APEP)? ............................................................................ 39 What Are Student Selected Clinical Placements (SSCP)? ..................................................................... 41 Conferences, Presentations And Publications ...................................................................................... 43 3. That Transition into Clinical Education Years ....................................................................................... 45 Things I Wish I Knew Pre-Hospital ........................................................................................................ 47 Motivation where does it come from? ................................................................................................. 49 Making the Most of Medical School ..................................................................................................... 51 Guidance For Direct Entry St. Andrews Students ................................................................................. 53 Guidance For Direct Entry Dental Students .......................................................................................... 55 Guidance For Direct Entry IMU Students .............................................................................................. 57 4. What happens in Year 3? Year 3 is designed to be an introduction to general medicine. You will have a series of semester ‘blocks’ that are placements on different wards with a consultant Clinical Lead. You will have two six-week blocks, and then three four-week blocks in different departments. Examples of these blocks include respiratory, cardiology, gastroentrology and surgery. This is followed by an ‘APEP’ (extended research project) and a student selected component (four-week placement in a chosen specialty). How is it different to previous years? Year 3 is a much more hands on style of learning, with a lot of time spent in the hospital. Each week, you will be expected to attend a ward round and clinic. You will have a number of “sign-offs” to complete, by talking to patients and examining them. You will also be taught skills such as taking swabs, observations and scrubbing up. You will go round the blocks in a group of six to eight students. Generally there are two St. Andrews students in a group together. The groups are allocated randomly, you typically go round with someone in your group. MFT Wythenshawe – A Welcome From the current Dean First of all, a very warm welcome to you from myself and all of our Undergraduate staff at MFTWythenshawe Hospital. Some of our staff have told me that the arrival of our new cohort of Year 3 medical students is the best time of the year for them. This is the real thing and I hope you thoroughly enjoy your next three years. However, please also bear in mind that hospitals and GP practices are fast-paced environments and patient care is a clinicianâ&#x20AC;&#x2122;s first priority. We have many excellent and committed teachers in Wythenshawe but sometimes, extreme busyness or emergencies can disrupt teaching and you will need to be flexible and understanding of this at times. However, both the undergraduate team and I are committed to giving you the best learning experience we can. So here are my top tips: 1. 2. 3. 4. 5. 6. Enjoy your clinical medicine experience. Your clinical years should be some of the best and most enjoyable of your life. Work hard but make sure you enjoy life outside medicine too. You will become a more rounded person. There is always something to do and learn in clinical medicine. Be flexible and make the best of your time. We all wish you luck, success and happy times! the NHS, Trusts may merge, change or increase. Also due to changes in NHS services there may be some changes in placement locations and in the usage of associated teaching hospitals listed above. Housing The majority of Wythenshawe Students live between Fallowfield and West Didsbury, with those from St. Andrews mostly residing in Withington and West Didsbury. Student Housing is competitive in Manchester, but fortunately you can often rent professional lets due to your degree after graduation from St. Andrews. For student lets, aim to have looked round before Easter to give yourself the best chance of somewhere you are happy with. If you decide to look at professional lets, you are in the very unfamiliar situation of being told you are looking too early if it is more than two months in advance of moving in. So don’t worry if you haven’t got anything arranged before summer, with a bit of looking you can find somewhere no problem. Car Travelling to and from the hospital (Wythenshawe) by car from Withington and Didsbury is extremely easy. From 15 minutes when its quiet, to 30 minutes at rush hour, it’s probably the easiest commute you are likely to get at any hospital. It is equally easy to use the metrolink (tram) or buses to commute to the hospital should you not have a car or be able to car share with someone in your group. Tram It is usually a direct tram to Roundthorn (nearest stop to the hosptial) or can be 1 change, and will take 30 minutes in total from the tram stop. Bus Bus services to Wythenshawe have recently been changed the services that now run are the 101 and 102, they take around 50 minutes to get to the hospital. Life In A District General Hospital Not a lot of people tell you about what it’s like in a District General Hospital (DGH). I personally had no idea what to expect when I went the first time. You hear a lot about the educational campuses, as that’s where you’ll spend most of your time, and the thought of going elsewhere may seem daunting. However, going to a DGH can provide you with some incredible learning experiences. Everyone will end up at a DGH at some point during their clinical years and it’s important to know how to make the most of it! Depending on the DGH, you may decide to commute or to stay over during the week, when given the option. They tend to be longer commutes, so staying over is definitely a valid option, especially when you have an early start the next morning. It can be frustrating at times being away from Manchester, but remember, it’s only for a few weeks! The accommodation is of a good standard, and is fairly similar to university halls. It involves a shared flat (usually with 2 people in your year), and a communal kitchen, bathroom and dining/living area. DGHs are a great place to develop clinical skills The teaching is usually well organised and of a high standard. 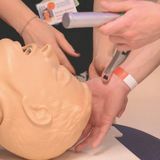 There is a lot of opportunity for clinical skills practice, such as taking blood, because the staff are often more able to find the time to watch you practice and are then able to give you helpful advice on how to improve your technique. It’s also the perfect time to get your UPSAs and prescribing skills done (which are tasks set by the University for you, to be completed throughout the year)! From personal experience, I can say that it is often easier to find staff that are able to help you to complete your tasks in DGHs than in the educational campuses. Another benefit to being at a DGH is that there are fewer students in your firm, which means it is easier to get one-on-one (or at least smaller group) teaching and help from doctors. This means that everyone gets more personalized teaching. For example, during teaching, everyone will have the opportunity to perform full examinations with structured feedback, as there is more time for teaching each person. You may also get opportunities to practice writing in patient notes, which you often don’t get in the educational campuses. Doctors at all levels, from FY1 to consultant, find the time to teach you and you get to know them well. The staff at the academic centre are extremely helpful, and there is often a clinical fellow attached to the DGH, who is there specifically to teach medical students. They are very helpful, as they provide a lot of individualised teaching and are always available to contact for any help or questions. How Do I Get There? By Car Or Public Transport Driving to Macclesfield every day takes 30-40 minutes in the morning and up to an hour to get back depending on what time you leave hospital and how bad the traffic is. In terms of public transport there is a train that takes 20 minutes from Piccadilly followed by a 20-minute walk to the hospital. Where Is Good To Get Accommodation? Year 3 students are offered accommodation. The hospital accommodation is within the hospital grounds allowing you to have a bit of a lie in every day and there is Wi-Fi access in all rooms. Where Can I Buy Lunch? There is the “Treetops” cafeteria in the hospital, which serves both breakfast and lunch along with sandwiches, salads, tea, coffee etc. for reasonable prices. There is a big Sainsbury’s 10-minutes away and there are also a few shops in the city. There is also a “grand round” every Tuesday for doctors in the hospital which medical students can attend where you can get free lunch. Is There Good Wi-Fi? There is Wi-Fi throughout the hospital but you will have to register your device with the hospital and they will then grant you access to it. Can You Use The Skills Lab? The staff in the skills lab are very friendly and apart from the weekly clinical skills sessions which are organised you can also go in any time if you feel like you need some additional practice. They can also be very helpful in helping you get some of your UPSAâ&#x20AC;&#x2122;s signed off. You’ll hear many people refer to Leighton as Crewe, which is where the hospital is. The furthest of the 3 DGHs, this is the one that most students are wary of getting. Hopefully, this guide will be able to ease some of your concerns. How Do I Get There? By Car Or Public Transport If you drive or know someone who does then getting to Crewe is as straightforward as it gets. It’ll take around an hour from Didsbury/Withington with no traffic. If you don’t drive it’s still fairly easy to get there. The trains to Crewe run very frequently and are very cheap (buying a day in advance gets you tickets for about £4). Once you’re at a Crewe you can either cab or bus to the hospital. Where Is Good To Get Accommodation? Crewe provides accommodation to Third Year Students. While at the beginning it’ll seem frustrating to have to get there for Sunday night and to spend an entire week away from Manchester and your friends, living on site might the be best thing about Crewe. The flats are literally 2 minutes away from the main entrance and this means you won’t have to worry about commuting every day, and you get to sleep in, a lot. Where Can I Buy Lunch? The accommodation provides a kitchen, fully equipped with utensils, which means going back and cooking lunch is super easy. However, within the hospital itself there is a restaurant, a café and a shop which sells things like sandwiches and snacks. The café and the shop are located right across from each other, right next to main entrance and while the restaurant is a little further away, there are signs to guide you so it’s really hard to get lost. Is There Good Wi-Fi? This is the thing that most students worry about, and the answer is yes. Once you’re registered to the residences Wi-Fi, you get it in your flat and it’s strong enough for you to keep up on your Netflix dramas. The Postgraduate Centre has got eduroam so you’ll be able to access Wi-Fi there as well. Unfortunately you won’t get Wi-Fi anywhere else in the hospital and occasionally you’ll have trouble getting phone signal as well. Is There a Library On Site? Yes. It is located in the Postgraduate Centre (there are signs so it’s easy to find). The library is 24hour access and equipped with Wi-Fi, tons of medical books and computers. Can You Use The Skills Lab? Unfortunately, you’re only allowed in the skills lab when you have a skills session. So you won’t be able to go in to practice your skills any other time. But, when there are only 2-3 students per ward, you hardly ever need it. You get tons of opportunities to do procedures such as bloods, cannulas and ABGs on the wards. How To Get There? By Car Or Public Transport Car drivers are offered parking facilities on site, which is paid monthly. There is also plenty of parking on the streets nearby if you would rather not pay for parking. For cyclers, showering facilities and bicycle sheds are provided. Students will be directed through the paperwork to get that sorted on their induction day. The bus 192 (terminates at Piccadilly or at Stepping Hill Hospital or Hazel Grove) some 192 buses stop in the hospital grounds and some carry on down the A6 Road (check on the front of the bus, you can get either) they go via Stockport station are very frequent. From Stockport bus station, you can get the 42 to Withington, Didsbury and Fallowfield or the 23 to Didsbury. Accommodation? This is unfortunately not offered for the duration of your 6/4-week placement at Stepping Hill. Lockers? There are free lockers in Pinewood House for those who cycle – it is also handy for keeping your coat and bag instead of carrying it around on the wards! If you need out of hours access to Pinewood there is a key that you can put a deposit on (£10) to let you into the building, you get the deposit back when you return the key at the end of your placement. Lunch? There is a canteen and Café’s in the hospital, which will be shown to you on your induction day. Otherwise, if you fancy something different, there are plenty fast food shops and a Sainsbury’s along the main road. There is also a common room in Pinewood House with fridges to store food and microwaves if you would rather bring your own lunch. Internet Access Whilst in the Education Centre (Pinewood house), there will be access to Wi-Fi. However, inside the hospital, that can be a bit patchy. Other Educational Facilities There is a library on site, which can be accessed 24 hourly if arranged so beforehand but is usually manned by staff during normal working hours. There is also a small computer lab in Pinewood. Be sure to get your library card and Open Athens login when you arrive. There are two skills labs, one of which (F15) is open to students wanting to gain more practice. The experiential learning timetabled will be provided by a teaching fellow. How Do I Get There By Car Or On Public Transport? Car Best method since public transport takes ages. About a half hour cars ride. Often, there’s a waiting list for the car parking permit at the hospital so you may have to park in the side streets nearby. Bus • 231 goes directly from Piccadilly Gardens but takes an hour to get there. • You can also take the 216 from Piccadilly and change to 231 (bound for Piccadilly) or 387/389/350 from the Ashton Bus Station, stands CDEF. Overall, this route is a slightly shorter than the 231 route but, obviously, a change is involved. • Note that 387/389/350 are first buses while 216 and 231 are Stagecoach. For this reason, I would recommend buying the System One monthly bus pass as it’s the same price as a First monthly pass, or a Stagecoach monthly pass. Train Nearest station is Stalybridge and it’s approx. an 15-18min ride. Note that the walk from Stalybridge to the hospital is also another 18-20mins. The train comes every half hour. Where Is Good To Get Accommodation? Accommodation is not provided. You could move nearby but your placement is likely only 7weeks long. Is There Good Wi-Fi? Yes, they have a separate Med Student Wi-Fi. Your Placement Co-ordinator should give you access to this on induction day. Is There A Library On Site? Yes, in Werneth house education centre. I think the timings are 8:30am-5:00pm. They have a separate IT suite too. 1. Read the guidance material Take time out at the start of the year to read through the guidance material. Make sure you know what is required, by when, and in what format. The guidance material includes plenty of top tips about how to produce high quality reflective writing. 2. Make yourself a Portfolio 'To-Do' list Clinical years are very busy. There will be many different things fighting for your attention. Making a 'To-Do' list makes your life much easier and significantly boosts your efficiency. Make a list of portfolio items you need to complete for each portfolio review. Whether on paper or your iPad, the key requirement is that you can quickly see what is outstanding at a glance. You can also see what you have already completed - a handy reminder for revisiting previous reflective pieces. 3. Little and often is easier than saving everything to the last minute Students who make regular, small updates to portfolio often report spending much less time on portfolio than students who carry out inefficient last-minute sessions. Not only that, but these last minute writing sessions often take up entire weekends of personal time. There are numerous, small quiet moments on wards or between clinics. A little time spent joting down a quick reflective piece during these times prevents portfolio eating into your weekend. 4. Set your own reminders There a very few reminders about portfolio throughout the year. You need to be proactive in reminding yourself to complete the work. An efficient way to do this is to schedule yourself a one hour session on the medlea calendar at the end of each placement. What Is A Logbook? The logbook is a collection of forms that records your learning throughout the year. It allows you to document any histories you have taken, any examinations which have been observed by the medical staff and any case presentations you have done. It allows you to demonstrate attendance to all the timetabled clinical sessions such as ward rounds, clinics, theatres and on-calls. It is also used to gather evidence of completing assessed mandatory procedural skills and developing procedural skills, which are taught in the skills lab. Why You Have A Logbook And Why Is It Important? Logbook is a useful indication of how much clinical experience you are getting during your placement. It also allows you to get more involved in your placements. It is important to do these forms as it highlights areas that may need a bit more practice. It also helps your supervisor get an idea of how much you’ve been involved in your placement before signing you off! The exact requirements may be different for your year as the Year 3 team have been listening to your feedback and streamlining the process, but in general we needed to be signed off for: History taking, Patient presentation, Patient examination, Ward Round, Outpatient clinic, Theatre list (only on surgery), On-call, UPSA (Undergraduate Procedural Skills Assessments) and Prescribing tasks. Some great tips about sign offs: • Top tip: BE PROACTIVE! Doctors don’t bite, so don’t sit around waiting for people to sign you off, put yourself out there and ask at the start of any session if you can do XYZ. Not only will you find getting signed off easy but you’ll learn so much more. Everyone likes to teach people who are enthusiastic and passionate about what they’re doing. • Incentivise them: Sometimes getting forms signed off isn’t an easy task as doctors are busy people but a good way to incentivise them is to make them aware you can give them feedback on their teaching for their portfolio. • History taking: Try and get the histories and presentations done early in the week. The most efficient way to do this is to go onto the ward and ask the junior doctors or nursing staff if there are any new/good patients to take histories from. This way you get patients that are normally happy to talk to you, have interesting signs/symptoms and are good historians. Then if the patient is happy for you to do so examine them and then log into the system to check your findings with the admission clerking. • Patient presentations: A good way to do this is to integrate it with your weekly ward round. Ask the doctor leading the ward round if you can go ahead of the ward round take a history and examine a patient and present your findings when the ward round reaches them. What Are Themed Case Discussions (TCD)? Themed Case Discussions, or “TCD”, is the name for the flipped classroom model of teaching that the medical school has implemented for year 3. What Exactly Is A Flipped Classroom Model? “Flipped classroom” means that you are expected to learn about a topic before, rather than after, the “lesson” on Fridays. The reading material is provided for you on OneMedLearn. It is often in the form of cases, but also includes videos, pre-recorded lectures and web links, all related to the topic of that week. The topics themselves cover general medicine and can be anything from headaches to haematological malignancies. The resources are released to you on the Friday of the previous week. During the Friday session you sit at tables in groups of around 6. The session is led by 2 or 3 doctors, who are often specialists in the relevant field. They take you through a series of unseen cases, based on your week's theme. There are pauses every few slides for discussion amongst the tables, usually about the differential diagnoses, investigations, and management surrounding the case. This discussion is mediated by the doctors, who rotate around the tables aiding your thought processes and asking further questions. They will summarise the discussions from all tables before moving on. The thought processes that TCD is trying to teach you is designed to mimic real clinical practice. You decipher the mass of information you are given and work systematically to generate a differential diagnosis or decide on the most appropriate management. How Is It Set Up? You sit in groups of 6-8 at a table. These are not set groups, you can sit with whoever you like each week. Each group has flipchart paper and a pen for any group notes during discussion. There is a projector for the case PowerPoint slides at the front of the room. Why Are They Important? As you will be spending a lot of your time attending clinics, ward rounds and teaching, it is difficult to schedule time for lectures. Plus, with students being sent to various district general hospitals, the old style of teaching isn’t appropriate. TCD is a much more engaging way to learn. Rather than getting spoken at in a huge lecture room, you will have the opportunity to have a conversation with the doctors and ask questions. During the sessions, it helps to reinforce the information that you have learnt during the week and clarify anything that you didn’t understand. Secondary Component Teaching (SCT) Secondary Component Teaching (SCT) can be considered as an extension of the Early Clinical Experience during Year 1 & 2. It integrates Clinical Communication, Prescribing, Ethics and Law, Patient Safety, Psychology and Sociology. The team is well trained to make sure all of these are covered, and includes: doctors, pharmacists, tutors from the medical school, simulated patients, expert patients, translators, and who else, every week could be a surprise! All of these topics are equally important To achieve a better understanding on how different issues may affect patients whom you are treating. For example: • You will learn how to communicate in difficult situations such as breaking bad news, talking to angry patients and families, and dealing with difficult colleagues. • You will develop your critical thinking about ethical and legal issues such as mental health, disability, and allocation of scarce resources. • You will learn how to take a medication history, how to do a medication review and how to safely prescribe. What is Clinical Debrief (CD)? Clinical Debrief is a timetabled session that takes place for 2¼ hours each week. It will be at the same time every week with your track and a facilitator; a GP who has an interest in teaching and years of experience in their medical field. The tutors have lots of knowledge and clinical expertise that will aid your development throughout year 3. They are there for your support and can point you in the right direction for any questions or concerns you may have. It is a mandatory teaching session therefore it’s important you attend your session to maintain good attendance. What happens during Clinical Debrief? CD begins with talking openly about what has happened in everybody’s week. We talk about the clinical experiences that you attended, anything particularly interesting and things you found difficult. During CD you will take it in turns to bring a case to discuss in detail. This is teaching you to “think like a doctor” by exploring the case. You will interpret a patient’s presentation and test results, chose investigations you think appropriate and consider how you would manage this patient. Clinical Debrief is not a teaching session CD provides a safe space for you and your peers to discuss anything that has happened to you during your week. This opportunity is really important because as you work through Y3 you will meet lots of new people, but for 12 weeks your CD tutor will stay the same allowing you to build a relationship and share stories in confidence. To get the most out of CD you need to communicate as a group and agree with your tutor what you would find useful to assist your learning and development. The time is yours to make the most out of, it is important you make it worthwhile and beneficial for everyone involved. What Are Prescribing Tasks? There are a number of prescribing tasks that need to be completed during Year 3. These will be uploaded onto your iPad (via eForms) for you to fill in and get signed off. Why Do You Need To Do Them? The prescribing tasks are there for you to learn about prescribing and to practise this alongside professionals such as FY2 doctors and pharmacists. It is a great opportunity in Year 3 to learn on the wards how important prescribing is as it’s a skill you’ll be doing every day once you qualify. You will also appreciate how much the pharmacists know and how valuable it is having someone on the wards who knows so much about most medications. This list does not exhaust just here! As you begin Year Three, you will begin to see the sorts of skills that nurses, junior doctors, and older medical students perform- and, will be able to shadow and learn from them. Once you receive your iPads at your Year Three induction, you will also be able to access a list of clinical skills you should be acquainted with on your eForms. The eForm will be titled ‘developing procedural skills’. Why Do You Have Them? • They are simply to check the skills you’ve been picking up whilst on the wards. • Importantly they test your patient interaction skills and ability to deal with uncertainty. These will be important qualities to have as a doctor in the future. History taking – can include a medication history taking. Basic examinations. Explanations of basic conditions, treatments or procedures. Prescribing station – could include prescribing or prescription review. Data interpretation. Top Tips To Prepare For The OSCE • Spend plenty of time on the wards during clinical placement, you’ll learn more by osmosis than you realise! • Be an active history taker – think about differentials as you take histories on the wards. • Practice the exams using the iBook and other resources to test your knowledge of common pathology. • Try to link patients you’ve seen to pathology but looking at pictures can also help. • Attending extra tutorials or OSCE revision session provided by your hospital / societies can be a great way to revise. • Speak to your Peer Mentors who will be able to give you some hints and tips. • Geeky medic YouTube videos are great alongside Nick Smith’s videos! • Practice! Practice! Practice with your medicine friends! Make up histories, examine each other and explain to each other too. • Practice giving short summaries at the end of histories and exams. • Take time to think how you’d explain common conditions/treatments/procedures in the TCD cases. https://patient.info/ or https://www.nhs.uk/ is helpful to get the level right. • Practice using both paper and e-BNFS to prescribe with the Manchester medical school “mock” prescription chart. • Make sure you have a clear strategy for interpreting x-rays/ECGs/blood results. Again practice these and look at examples of pathology. Progress Test In Years 3-5 If you were in Manchester for Years 1 & 2 you already experienced the joy of progress test several times over. If you were in St Andrews you will take it once before you arrive to give you a little taste. Dentists and IMU students get a practice early in Year 3. The Principles Behind the Progress Test The concept of the progress test is to encourage continuous learning, and to discourage a superficial approach, i.e. cramming facts just before the exam (which are forgotten the day after…). Questions are supposed to test the connections between the principles we learn early on and clinical knowledge gained from experiences. You may therefore, be required to use your applied anatomy and physiology to answer clinical questions. As The Exam Gets Nearer As the progress test comes closer your best bet is to do some structured revision: • Practising random questions is generally an inefficient tactic for revision. You may learn the odd fact here and there but trying to retain new knowledge in this way can be overwhelming. Going through the Oxford Handbook (or another book that covers most topics), page by page as a supplement to working through online TCD cases, can be extremely helpful. If you do well move on to the next topic. If you do badly, time for more reading before hitting the selftests again. • The best question banks are those which offer questions topic by topic, not just mixed mock papers, as this helps you to organise your revision. A key feature of a good question bank is that it will explain not only which answer is correct (or incorrect) but also why it is so. Reading the explanations is important even if you get the answer correct, as they should add to your total understanding of the topic. • You may find it useful to create tables /summaries of causes of key symptoms and signs – what are the main causes of acute onset of breathlessness? Haemoptysis? Dullness to percussion in the lungs? Blood in the stools? Night sweats? ... Make sure you can tell one cause from another by listing risk groups, symptoms and signs that would point to each possible diagnosis. Learning random facts is not going to help now; you need to make links. • Question banks like passmedicine not only help you to apply the knowledge but you start picking up patterns and key cues. e.g. widened mediastinum = aortic dissection. • There are official progress test example questions on 1Med Info: https://www.onemedinfo.manchester.ac.uk/blog/infoobjects/50-sample-progress-testquestions/?section=6527&topic=6533&acyear=2018-2019 which can be useful to test yourself and prepare for the style of question when approaching the exam. • Top Tip - Make sure you know which is the first line and which is the definitive/diagnostic investigation when learning about a condition • Top Tip - You may now find that where you had an excess of time in pre-clinical years that is now not the case. This often is as a result of knowing much more and therefore being able to make a good guess at most questions. This catches a lot of people out, particularly in 3rd year, so the strategy I recommend is circling any questions you do not know the answer to immediately for review and moving on. I would have a low threshold for doing this, because there is likely to be questions later in the paper you can answer quickly and with confidence that you otherwise may not reach. Should I Try to Learn Specialties We Have Not Covered Yet? Because the progress test covers all specialties, it is tempting to try to learn new material just before the exam. Should you try to learn about vaccines or contraception in year 3 for example, even though you have not covered these yet? Attempting to cram a topic without clinical context is likely to be ineffective. Seeing patients and getting their story is probably the best stimulus to create lasting memory of a topic. You are making a judgement on the probability that the facts you learn will come up in the exam in that exact format, rather than how well you can learn and retain a topic. The questions are often designed such that they require multilevel knowledge and are not just fact recollection. You may well waste your time reading something new that you could have spent looking back at an area you feel weak on. Use Your Feedback The feedback from progress displays question by question correct and incorrect answers, as well as your scores in grouped areas compared to your cohort mean. Although it might seem tedious to work through this information, it can be very worthwhile if used properly. The first step to making this useful is reviewing it as soon after the exam as possible, as it won’t make nearly as much sense if you leave it until later. From the feedback you should be able to identify where your weaknesses are by comparing it to your overall score and your cohort scores. This should identify areas for development in the future and you should create action plans to address these. This may require you trying new learning styles or focusing on a particular aspect such as management of conditions. Reflecting on your Progress test feedback is mandatory anyway, so make it work for you! Year 5 In final year, the progress test becomes a pass/fail, summative assessment. The pass mark is not determined based on cohort scores, but about how you compare to the minimum required standard, this is called the Angoff method. This is a fair approach as in theory every student could achieve the standard required to pass finals. If you are interested in knowing how the pass mark is determined and you can find information in the Programme Handbook. But more importantly, remember that the vast majority (90 – 95% usually) of students pass exempting exams, and if you don’t there is a second chance in finals. There is lots of support for students preparing for Finals organised by each clinical education hospital, and again the majority of students pass at this point! What Are Applied Personal Excellent Paths (APEP)? The Applied Personal Excellent Paths, or APEPs for short, are projects that are undertaken in third year. These are 10-week student selected components in which you will participate in either a research or a nonresearch project. It gives you an opportunity to work with leading researchers and professors of your chosen field. The aim of the project is that by the end, not only will you have completed a piece of work, but also you will have studied and researched an aspect of medicine in detail, understood how to critically review literature, used basic statistical analysis and presented your findings or work. All good practise and experience for the future. What types of projects are on offer? You will be choosing your APEP quite early on in the first semester, very soon after starting your clinical years. You might be quite busy during this time trying to get used to the clinical year and placements. Hence it is useful to have a think about what type of project and specialty you want to do your project in early on. There are a range of projects available, but they mainly fall into these categories: • Research: Research projects are an amazing opportunity to work as part of research groups led by leading researchers in their fields. They can range from lab based projects using special techniques to office based projects analysing data to collecting clinical data themselves to answer a research question. These projects can be particularly suited for you if you are thinking about a career in academic medicine or just want to improve your academic skills. • Literature Reviews: Literature reviews allow you to read about and understand a chosen area of interest in greater detail. It will not only allow you to improve your critical appraisal but also be able to write your findings coherently. Often literature reviews can be supplemented by meta-analysis which can be a great opportunity to learn to work with larger amount of data and bring them together. • Clinical Audits: These are projects which look at how well a particular department or specialty is doing in providing care in comparison to standards laid down by national guidelines. It mainly involves collecting data from patient records or clinical environment, analysing it to assess standard of care and suggesting changes to clinical practice to improve care. This can be something for you if the clinical side of things interest you more than the academics, however do remember that you get a chance to do another audit in Year 4 QEPEP too. • Service Evaluation: These projects tend to answer the question “What standards does the service currently achieve?” These can seem to be very similar to audits; however, the projects mostly involve analysing data which has already been collected as part of databases and checking if there is anything that can be done to improve the service and management of patients. Applying - It’s important that when you apply to the projects, to choose one you are interested in. It sounds obvious but you do not want to spend 10 weeks of your life on a subject matter you have no interest in. You probably won’t want to put effort in and produce something subpar, and you will not gain anything of benefit with that. There are hundreds of projects to choose from, so having a rough idea about what area interests you can make the selection easier. Meeting Tutors - When applying, try and arrange a meeting either in person or via Skype/phone/Facetime. This is very important because it can make all difference for both you and the tutor. They may be able to convince you to do something you had no interest in previously. You may also be able to make a good first impression, important for when they decide whom to work with. (Read around the subject area before meeting, it’ll be helpful!). Be Quick! - It is also important to note that if you are interested in something, go ahead and apply for it! Chances are, there will be 10 other people in your year that want to do the same thing. Be quick about it! Some of the most attractive projects get up to 30 applications in the first couple of days. Rejection - If you are rejected from an application, do not be disheartened. As said previously, there can be a lot of competition. Look around the topic/area for similar projects. If you can’t find anything similar, contact the tutors directly because they may happen to have something but haven’t put it up on the website. Finally – Think of this as an opportunity, not coursework/work to do. This has been arranged to beneficial to you and you can make it so only if you want to gain the most out of it. Choosing your placement To ensure you spend your SSCP in a speciality or place that you enjoy, it is important and helpful to be prepared for the application as well as aware of the deadlines, all details can be found on OneMedInfo. There is an opportunity to self-arrange your placement should you know exactly where or who you want to do the block with. The deadline for this is at the beginning of April which is before the deadline for the general SSCP application (not self-arranged). Reaching out to a specific consultant or department well in advance of this April deadline is the best way to ensure your self-arranged SSCP gets organised, and remember, meeting the supervisor in person is always the best option! Get emailing as soon as you know what you want to do. For those who don’t have a specific SSCP in mind or who just want to wait and see what all the options are then don’t worry about the above deadline and instead fill in the general application form that the university releases later in April. For this application, a large list of available placements and their supervisors is posted online, and you filter through them to shortlist and then rank your top eight choices. This needs to be done by early May before all SSCP placements are confirmed in late May. You can email and/or meet the supervisors attached to the general application choices to gather more information and show your interest. Why Do You Have Them? The SSCP is a valuable and less pressurised opportunity to spend time in a department that you are particularly interested in or in something that you’ve never experienced before without the weekly requirements of the timetabled blocks you will have been on earlier in the year. Conferences, Presentations And Publications What Can I Do? You can present a poster or presentation at a conference, publish research or apply for academic prizes. Publication types include articles in journals, reviews, reflective pieces and even letters. Publications are considered educational achievements and bear weight in your job applications. These are great opportunities to develop expertise in your chosen speciality and gain insight into a career in research, all whilst developing your research and presentation skills. I Can’t Find The Time! Some scientific bodies only ask for a 500-word summary, which is one hour of typing. You can begin with subject areas that you find interesting, or perhaps draw on research conducted during your intercalation year. Start with the resources we mention below and keep looking until you find something that catches your eye. Work on your chosen project for 20 minutes a day and something will come together quickly. Don’t forget to email mmsprizesandpublications@manchester.ac.uk if you have won a prize and we will sing your praises on our Twitter page! What can I do with my project other than submit? Read â&#x20AC;&#x153;A Guide to Getting Publishedâ&#x20AC;? Is this a postgraduate conference? Yes Have you received more than 2 conference bursaries during your time as a student? Ask your supervisor or department if they have any funding. Some students have been successful in lowering the registration fee for conferences if they have shown evidence that they already receive financial support from the university i.e. the Manchester Bursary. 3. General Hints, Tips and great Advice: That Transition into Clinical Education Years Hello I’m Claudia! I’ve had just finished 3rd year and I was intercalating doing an MRes in Medical Sciences. I’ve made that transition into the clinical education years and it’s quite the adjustment! I felt at that time there wasn’t much guidance on the transition so I’m writing this from my own experience to (hopefully) give you some insight into what it’s like. What Equipment and Resources? Firstly the practical side. Absolute essentials are a biro and spiral bound notebook (it’s hard to write on something which can’t fold around when you’re standing up), nothing fancy as you will lose your pen or spill something on your notebook, guaranteed! This is for writing down impromptu teaching and what the doctors who kindly take you under their wing tell you to look up. Learn this stuff! Doctors will quiz you and you don’t want to look like you’re not interested as it might lead to a disappointing sign off. Get a good stethoscope and don't be afraid to go for a colour you like! Buy a “nurses watch” with a second hand so you can take the pulse when examining a patient. I got one from amazon with a clip (not a pin) so you can hook it to your lanyard or belt loop. Having these on the first week will make it easy to dive in with examinations, which I would start practicing early so it comes naturally for the OSCEs. Oxford Handbook of Clinical Medicine is the bible of 3rd year. It’s small (you can easily take it to wards for reading between ward round and clinics) and every TCD case is in it and really well explained. I also used ECG Made Easy, for interpreting ECGs, which is scary at first but you do get better. Just remember structure and WiLLiam MaRRoW (this will all become clear!). I used online resources to help with Themed Case Discussion (TCD). I used Passmed it is a multiplechoice question website which helps with the progress test but also gives information sheets for conditions. This is particularly helpful with very similar groups of conditions (e.g. cholecystitis/ cholangitis/ choledocholithiasis, yes they are all different, nightmare) as they are all on one page and it explains the differences. BMJ best practice and NICE guidelines are also helpful for TCD. You need to fill in forms on the iPad each week so the medical school can see you’re progressing and are involved on the wards. These forms include history taking which you record yourself, and forms which a doctor will sign off, (history presentation, clinical examinations and clinic/ward round/theatre attendance). The forms were a source of stress for me (at 1st) and it’s easy to get hung up on the fact you did a lot of things in one day and learnt a lot but didn’t get a form signed off. This can demotivate you but remember you’re doing this to learn - and if you find a doctor or nurse on the ward who saw you do many activities you could ask them to fill in a few forms in one sitting. Undergraduate practical skills assessments (UPSAs) and Prescribing and Medications Safety Skills (PMS) are mandatory sign offs for clinical education years and there is a list that you need signed off for each year. I recommend getting the full list at the start of 3rd year so you can identify placements where you can sign them off (scrubbing in for example, you can only do in your surgical). Things I Wish I Knew Pre-Hospital Weekly cases – is it PBL? Each week you’ll have access to online case material on 1MedLearn which you need to work through before an interactive session each Friday. Much the same as PBL, you can take the studying at your own pace during the week and use any resources that you like to supplement the case. Find your own way of doing things but do try to have a look at the resources provided, even the dreaded NICE guidelines - they’re more valuable than you might think! The Oxford Handbook = The Medical Student Bible An amazing book that contains most of what you need to know on the wards and in clinics. It’s great to keep with you for a quick check through when you come across a new condition or want to look up management for something common. It’s not enough alone to pass your exams and manage a patient. District General Hospitals! The idea of a placement at a DGH can be sad, but don’t judge it until you’d experience it. You will find everyone is really friendly and the smaller numbers of staff, students and patients means you can really get to know each other. Other advantages also include smaller groups, which can often mean more focused teaching. Make sure you have your travel and accommodation arranged in good time before your placement is due to start. There may be travel bursaries or accommodation available. At Preston, you also have the possibility of being placed at Chorley District Hospital. This will enable you to get both acute and DGH experience within the same Trust. There is a frequent free shuttle bus between Royal Preston Hospital and Chorley District Hospital so transport between the sites is easy. There is also an education centre, skills lab and library at Chorley too. Wards, Wards, Wards! The ward is one of the most important places to invest your time during your clinical education years. It is the perfect place to practise history taking, examinations and skills, and get involved with ward-life. There are a host of opportunities available, so take advantage of them! experience on wards will ensure you build up your confidence and contribute to your professional development. Practical Skills Practice in the skills lab is great, but on a real patient is even better. The first time you perform a skill such as taking blood on a patient it can be a scary experience. If you are unsuccessful, try not to panic and don’t be afraid to ask for help. The only way you can improve is via practice, and there are plenty of opportunities to do this on the wards and in some clinics. If you improve your skills you can become a helper on the ward, not feel like a burden. Nurses Are A Godsend! Be nice to nurses and they’ll be nice to you! Take the time to get to know the nurses and shadow them to see what they do. Not only will this expose you to different healthcare professionals and their roles, but it can also help to build your confidence with patients and practical skills. Cancelled Teaching Staff involved in the teaching of medical students will often have rescheduled their normal activities, cancelled outpatient clinics, operating lists or ward rounds in order to teach you. Sometimes however, some teaching activities may have to be cancelled at the last minute because of the needs of patients. Make sure you go through the undergrad office to report it so that it can be rescheduled and try to see it as a blessing in disguise. There is always something you can be doing, such as reading, practicing skills, or getting some more experience on the wards! Portfolio Unfortunately, this is still compulsory, but it becomes more relevant. Start to see this as your CV and a document of your professional development. Try and make it more personal, and think about expanding it with what you find interesting. The best way to approach PPD is to gradually add pieces during the year instead of all in one go at the end. Find time each week or fortnight to update it – you’ll thank yourself for this in the end. You will need to be more independent with your portfolio this year but don’t forget to ask for support if you need it. Motivation where does it come from? You are all inspirational individuals, you had ambition to apply to medical school, you wrote your best personal statements, you excelled at interview, you took action to achieve the top grades for entry requirements, you incentivised yourselves and each other through phase one. Now you need to continue that drive to be able to study after spending hours on clinical placements in hospital Monday to Friday. As always with motivation; you get out what you put in. The more enthusiastic you are asking pertinent questions during placements then the greater benefit you will gain. Sign up to as many additional opportunities as you can. It’s a privilege to be allowed into certain areas of the hospital to learn and you may not get the chance to experience them further on in our careers. I have worked many jobs in customer service, sales, banking and recruiting along with a few dodgy temporary roles. On the whole I was successful earning a considerable amount of money; however I could not achieve job satisfaction and felt empty for a lot of the time. Realising that life is not a dress rehearsal (we only get one) I developed the impulse of changing my profession to a childhood desire of studying medicine and becoming a doctor. Motivation waxes and wanes in all of us at times and medicine is a difficult degree to undertake. When my interest in studying is low I think back to my last job, the sales targets, the headset, the hardnosed outbound business calls I had to make every day and I ask myself if I want to go back to that. The answer is always no. My incentive is to do something useful and rewarding with my life, to help people make the best of their health. This thought sets me back on to the path of fulfilling my ambition of being the best doctor that I can be. Unfortunately this dream cannot be realised by prayer alone, I have to study for it. This gives you, the reader some insight into what motivates me to study as a medical student; however I am not a typical medical student, therefore I set up a survey of 100 medical students to find out about their motivational behaviours through five multiple choice questions. There were originally six questions however gender did not alter the responses enough to be included. housing, with partners, parents or in your own family home. My peers who are studying whilst also raising a family are a significant inspiration to me. I am fortunate to have no distractions except those of my own desires to prevent me from studying. I respect those who can only find peace and quiet required for concentration after parenting duties have been fulfilled for the evening. How do others motivate themselves to study? Having covered the what, who and where my questions moved into the more practical angle of How? Firstly, “how do you motivate yourself to study after a long day in the hospital?” provided a more balanced response (see pie chart below) than the initial questions. Making the Most of Medical School Can there be more to Medical School than passing exams? Well yes, yes there is! And it’s all related to making that CV even bulkier and tailoring the opportunities the medical school provides to suit your future career as a doctor. Whilst also giving you some great experiences which will not only make you a more well-rounded individual but, will give you that perfect work/life balance we all strive to find. There’s a wide range of extra-curricular activities available through a huge range of medical societies, which contribute to making your student days even more fun. Whether they are educational or recreational, they help to make you are more knowledgeable, employable, future doctors. Many opportunities may not directly gain points towards your foundation placements, but they have a range of other benefits as illustrated below. Benefits of getting involved in extracurricular activities. Prizes, Publications and Presentations These look great on a CV and carry certain kudos at Specialty training interviews and Academic Foundation Programme entry. They could be a lot of work so you want to be selective and only go for essay topics that you are really interested in, or that match your APEP/PEP topics. It’s surprising how few students actually enter competitions, so your chances of winning may be higher than you think. Societies There are so many to get involved with and they are a good way to show commitment to an area of medicine. If you feel like getting involved in the committee, it can be another thing to put on the CV to provide evidence of team involvement, organizational ability, leadership and commitment to a specialty - all essential skills for career progression. They are not just based in Manchester, Preston has its own societies as well that you can get involved in. REMEMBER: University is your chance to experiment, learn more about yourself as well as gaining an academic qualification so make the most of it! Try new things, if you don`t enjoy them then find something else. Things will be very different when you enter the working world, so enjoy being a student whilst it lasts. Guidance For Direct Entry St. Andrews Students What Should You Do Before You Get Here? 1. Make sure you save all of your uploads from your St Andrews portfolios as they may come in useful at Manchester! 2. Furthermore - Save St Andrews lecture slides now! Your Galen ID expires 6 months after you graduate, so it would be useful to save all of the clinical skills and examination handouts before then. 3. Buy an iPad mini case and an Apple ID (that you know the password to) – it will save you the hassle when they give you a shiny new iPad mini. 4. It is definitely possible to share a flat even if your friends are at different hospitals! Arrange flat viewings for Easter Break/a free weekend/summer holidays. Zoopla, RightMove, GumTree and SpareRoom are great places to start searching online. Fallowfield is the area where most Manchester University students live, but we recommend living as close to your respective hospital as possible! If you are unsure where to live/who to move in, there are a variety of private student halls located all over Manchester too. 5. If you aren’t bringing a car with you, it’s worth having a look to see where the nearest tram stop/bus stop would be when looking for houses. You can get annual bus pass for around £250. 6. Bring any books from St Andrews that you may already own. Particularly ‘Macelods Clinical Diagnosis and the ‘Oxford Clinical Handbook’. You will not need to buy any other anatomy, pathology or physiology books whilst you are here. However, there are some OSCE books that are highly regarded at Manchester. These include the ‘OSCEStop Guide’ and the ‘OSCE Cases with Mark Schemes: A Revision Aid for Medical Finals’. 4. After the simple days of Galen, the idea of MedLea, 1MedLearn and your iPad eForms app may be very confusing - but you will get the hang of it very quickly. Be sure to look at 1MedInfo for the minimum logbook requirements you should be achieving each week. 5. Review all the examinations and procedural skills you were taught in St Andrews, they vary very slightly at Manchester. On your iPad, under iBooks you will find the full checklists for all the Manchester examination protocols – stick to that and you will be fine. Also, you can watch Nick Smith’s YouTube tutorials! 6. It’s never too late to join a society, you might not discover some until later in the year but don’t let that stop you! 7. Be keen – there are so many opportunities that present themselves to you if you ask or show interest! Opportunities for publications, research, and unique placements are but a few things you can get involved in. 8. Don’t worry about integrating! Everybody in Manchester is split up between the 4 clinical education campuses in 3rd year and, with a year so large, most Manchester medics don’t know who is from St Andrews or who has always been at Manchester so you’ll fit in right away. 9. In September, you will be given a Peer Mentor from the Year above, Facebook/WhatsApp them if you have questions – they can help or at least direct you to the right person. 10. Electives take place in Year 4 at Manchester, so if you are looking to go somewhere international, start researching options in year 3! Guidance For Direct Entry Dental Students Why Are You On The MBChB Programme? So you thought you were done after five years of Dental School, but alas, you have a burning desire to be an Oral and Maxillofacial surgeon, or perhaps a curiosity for Medicine. This has resulted in landing you here! Congratulations... here are a few tips which I hope you will find useful. What Should You Know Before You Get Here? 1. Buy a stethoscope. Most students have the Littman Classic II, Classic III or Cardiology III. All are adequate for the purposes of Medical School. 2. Do not worry about reading clinical books or 'revising' in advance. You will learn what you need to when the time comes. Relax and enjoy the last few days of freedom. 3. Most books you will want to refer to are accessible as eBooks through the university and hospital libraries. Do not get bogged down in buying specific books or subscriptions until you are familiar with what you are likely to need and use regularly. What Should You Know Once You Arrive Here? There is a lot of information given to you during the two induction days, which take place at Manchester University. It may seem overwhelming at the time. 1. The iPad logbook app and online Professional Development Portfolio (ePPD) can seem very complicated initially (you may begin to yearn for the days of the simplistic elogbook used in Dental Core Training). Trust me, it is all relatively straightforward once you get used to it. Careful perusal of published guidance on 1MedLearn will clearly set out what you need to do and how often, so do not worry if you don't understand it all during the induction. previously been shown the technique, you may consider approaching the Medical Educators in your respective clinical education campuses early on. If you ask nicely they may be willing to run through some of the essential system examinations with you to help prepare! 4. You will all be familiar with ward work, so enjoy the relaxed pace of being a third-year medical student and having no formal direct patient responsibility for the first time in what may be 8 years or more. Get involved and be interested goes without saying. 5. The Ackland Anatomy online resource and Complete Anatomy iPad app are useful resources if you wanted extra support with anatomy. Guidance For Direct Entry IMU Students Why Are You On The Manchester MBChB Programme? University of Manchester is a highly reputable university that has been long established. The medical degree that you will obtain here will be something that is highly valuable and recognized worldwide. However, the main reason that attracted me to Manchester is the city itself - vibrant, alive and filled with endless opportunities and possibilities. What You Need To Know Before You Arrived: About Living In The UK? Summer practically does not exist. No, I am kidding; it does, probably for just a few weeks. Generally, UK is a nice place to live in. People are generally friendly and helpful and it is safe to walk on the streets. As students we often worry about the cost of living. Don’t believe what the TVs tell you about the UK, not everyone dresses or speaks like the actors in the movie shows. You will understand when you get here. I would recommend trying to get in contact with your seniors/ possibly staying with them, as they will REALLY REALLY BE ABLE to help you up until your graduation day. Bring loads of Malaysian food, as you'll be very homesick initially. However, things are not expensive and in fact very affordable once you find out where to get the cheapest groceries, clothes etc. For household items or furniture, there are a few Facebook groups out there selling secondhand items from seniors. Do check them out! Try to settle your biometric residence permit (BRP) upon arrival because you’ll need them to open a bank account. About Manchester As A City? Manchester rains a lot. Please bring a sturdy, good quality umbrella or anything that protects you from the rain and the cold. Aside from that, Manchester is awesome! The airport is near and everything is available in the City Centre. We even have our own Chinatown for Chinese, Thai, Viet food and curry mile for the middle eastern/Indian food and etc. There are just endless things to do here in Manchester - sports, clubs and societies, museums, art and history, food, hipster cafes, shopping, nightlife… the list goes on. You name it, Manchester has it. Manchester is also set in a strategic location in the Northwest. It is a good base for you to travel either to the South or North of England and Scotland making it cheaper to travel. And the best part! If you do know how to manage your studies well, you can even go travelling in the weekend! If you are an outdoorsy person, Manchester is surrounded by beautiful countryside - for example Peak district, Lake District and loads of access to beautiful walking trails. About Where To Live? This is mainly a personal preference and depending on where your clinical education campus is. You might want to live close to your, which might be far from the City Centre, or live in the City Centre and commute to the hospital every day. You will be sent to one of the main four clinical education campuses, (MFT) Wythenshawe, Salford, (MFT) Oxford Road and Preston. If you are in Preston, it’s going to be a whole new game living there as it takes 1 hour plus to commute by train, so basically you are there most of the time. For the others, staying in the City Centre is LOVELY. Most of us seniors chose the latter because the transportation system is much more accessible in the City Centre, as sometimes you might be sent to other hospitals or clinics for certain placements. It is also important for us to highlight that average rental in the City Centre is around 500 pounds excluding bills but the rooms are a lot nicer than what you can get in the main cities such as London or even Edinburgh. If the above is too troublesome for you or it’s your first time, book university accommodation to avoid hassle (and it's guaranteed warm). About Getting Around? Public transportation in Manchester is excellent. A yearly bus pass costs about £250 and can practically bring you anywhere. You can also opt to take the tram (something like the LRT in Malaysia) or the train (similar to the KTM in Malaysia) to different places. University of Manchester provide annual travel bursary for all medical student. Hence make the best use of the money. If you want, you can get a car, but of course, you need to get a driver’s license here. No Malaysian driving license will work here! About Studying Here? Daily activities in general include ward-based teaching, ward work (i.e. taking histories, performing examinations, presenting cases and ward rounds) and clinic work. There are minimal formal lectures; therefore, self-study becomes more important than in pre-clinical years. You can cater it to your own needs and even plan it based on your blocks. We also have weekly Themed Case Discussions which is similar to PBL, but is more of a large group workshop. Along with this, we have weekly sessions (SCT - secondary component teaching) to discuss various aspects of communications skills, similar to specific CSSU sessions in IMU. Another weekly activity we have is Clinic Debrief where you can decide as a group with a designated GP on what to discuss and learn together in your groups. Make sure to get in close contact with the other Malaysians or form a group so you have friends to practice for OSCES, which is heavily regarded here in Manchester. page on Facebook to keep yourself updated! You won’t regret it. Besides that, if you are interested in working part time or do any other sort of extra curriculum activities, do not hesitate to contact us seniors! We are always happy to help. About Getting to Know Other Students? Be open-minded and friendly! Students here in Manchester are very friendly and they are willing to make new friends as long as you are willing to! Do I Need To Bring Any Books Over To Manchester? In all honesty, the Oxford Handbook of Clinical Medicine and the Oxford Handbook of Clinical Specialties are all you need. If you prefer using books like Kumar & Clark or Davidson, you can always get the soft copy from the seniors. Alternatively, the year 5 students would usually sell them for quite a ‘decent’ price after they passed their finals. Just bring your laptop. You will be given an iPad from the medical school! TOP TIP – International Students also need to practice communication skills with UK native students to pick up on all the subtleties of the language, so grab a UK student and offer your Malaysian contacts for electives in return for help. 4. Further Useful Information Dress Code There are always questions about the dress code, so if you are wondering about what to wear on the wards and in the clinics, here is the advice! Fainting In Theatre Why Is This Important? During 2016/17 the Medical School asked and 174 of 473 (37%) students surveyed had at some point felt faint or actually fainted in theatre. It can happen to anyone, at any time. Unfortunately, in a very small minority of cases, it can have an effect on the operation and this is why it is so crucial to know about, especially as it is largely preventable. Contrary to belief, it is largely NOT due to squeamishness. Main reasons for fainting in theatre include feeling too hot, standing for too long and wearing a facemask. What To Do If You Feel Faint In Theatre (Previous Medicine Students said): • It is INCREDIBLY common so don’t be embarrassed to speak up!! If you leave it too late, this could put the patient at risk so SPEAK UP ASAP. • Sit down. It’s better to sit down than pass out and hurt yourself/someone else/ the patient. Lie down if you feel woozy sitting up. • Leave theatre. • Get a drink of water and something sweet to eat once you’ve come round. What You Should Do If Someone Else Faints In Theatre? • Don’t laugh or be cruel. It can happen to anyone. It might happen to you in the next theatre session. Reassure them that this is very common and largely preventable. • Get them water, leave theatre with them. Let theatre staff know. • Try to protect the patient and sterile fields. Peer Mentoring (Clinical Education Years) What Is Peer Mentoring? Peer Mentors are there to support you through your transition from University life into your Clinical Education Years. In the good old days, you may have had someone from the Mummies and Daddies Peer Mentoring scheme, or something similar if you weren’t at Manchester, to support you. When you start your Clinical Education Years, you will be allocated someone who will have just been through Year 3 themselves. They’ll be equipped with the experience and the knowledge to answer any of your questions, because we all know this transition can be challenging. How Does the Peer Mentoring Scheme Work? The Student Coordinators for this scheme meet with University and clinical education campus staff every six weeks to talk about the kind of support that the Year 3 students might be needing at that time. They also discuss and help plan the events and activities that take place to support you. Your Student Coordinators will be in regular touch with your Peer Mentors, and they will contact you. Also, you can contact your Peer Mentors at any time with your questions or to ask for advice as you progress through Year 3. If they can’t help you they will know someone who can! Why Do I Need a Peer Mentor? Your Peer Mentor can help you through the transition from lecture theatre to the wards, pass on the little tricks they’ve acquired and even sometimes just offer advice to a fellow student in need. They will have travelled to all the various hospitals within your clinical education campus, so they will know the best routes to take. They will have chosen their APEP and completed it, so will have some words of wisdom. Students say they really benefit from their friendly advice. Who Will Be My Peer Mentor? Your Peer Mentors will be Year 4 Students from the same clinical education campus as you. They come in pairs, and will mentor a small group of Year 3 students including Manchester and Direct Entry Students. They are trained to help you and they know how you are feeling right now as they were in your position last Year, but most of all they want to help you. What Can I Ask Them? Does this hospital have accommodation? Which is the best way to travel to this hospital? What did you take to your first day on the ward? These are just some of the questions, but you can ask other questions that have been on your mind, but you weren’t sure who to ask. They can be contacted via email, 1 Med Buzz, or on other forms of social media that you’ve agreed to use. All Year 3 students should receive an iPad at the start of the Year, so if you’re stuck on how to use the eForms or any of the apps related to the programme, your Peer Mentors can also offer some help and advice. Your questions don’t always have to be about studying, remember that the work/life balance is just as important, and can be just as difficult to manage. 1MedBuzz …is a great resource for enhancing your time on this prgramme. It is the 1Med hub for extra-curriclaur activities, careers resources, peer mentoring info, society info, opportunites, and so much more! Buzz is an excellent tool for keeping up to date with what’s going on and the vast amount of opportunity availble to you! Opportunities The Opportunities section of 1MedBuzz is a goldmine of useful information about upcoming seminars, competitions, volunteering, student surveys, conferences, workshops, work experience, funding, and more! If you want the opportunity to step up and expand your skills in leadership, teamwork and showing initiative, this is also the place to and find out when and how to become a student rep, peer mentor, and student coordinator. Every clinical education campus is represented here, so a range of opportunities are advertised throughout Manchester, Wythenshawe, Salford and Preston, as well as elsewhere in the UK! The University of Manchester medical school posts anything and everything that it hears about, and so do other students and societies, so it really is worth checking regularly for updates. Careers Q&A This section hosts ‘Ask Me Anything’ forums with Alumni of the University of Manchester Medical School and outside clinicians, in which they post a profile outlining their Career pathways and invite you to ask them about it. These online Q&A sessions are an excellent way to find out more information about particular specialties and career plans. Last year we had Q&As for Academic Foundation Programme, Radiology, and General Practice. Go and have a look at them to see what they’re all about! Events Events are frequently posted on Buzz. To keep up with extra-curricular activities, we have a very handy events calendar that advertises all sorts from conferences, to careers events, to lecture series, to society events… the list goes on! Anyone can post their events on here, so if you are part of a society it’s an excellent way to promote your events. If you think you have an inspiration for a blog post – whether it be on a topic you’d like to speak about or some advice you’d like to share – then send an email to 1medbuzzcomms@manchester.ac.uk. Student Reps This section on Buzz and is where you can find out who your reps are, how to get in touch, and about what they are up to! The Student Reps page provides you with the contact details for Reps from various areas of the programme, so that you can get your voice heard. You can track progress by viewing the minutes and updates from meetings with staff that the Reps are involved with. You’ll find that there are specific reps for the programme that represent each year group, direct entry students, international students, and European Studies students. Peer Mentoring There are two Peer Mentoring Schemes on the MBChB programme, the Mummies and Daddies Scheme, and the Clinical Education Years Scheme. Now that you will be beginning the transition in the clinical years, you are part of the latter scheme. The Peer Mentoring page on 1MedBuzz provides contact details for the Student Coordinators of each scheme, key information on how to become a Peer Mentor yourself, and even has links to this Survival Guide in case you need it again! In September, you will also be able to find the contact details of your allocated Peer Mentors. Placements The Placements section on 1MedBuzz is incredibly valuable in finding out addresses and contact details for GP placements far and wide! You also have the opportunity to leave informal hints and tips about each placement, for example car parking facilities, preferred entrances, or even just where to get a good cup of coffee nearby! It’s worth looking at if you have any queries about a placement, as well as adding in your own hints. This sort of detail is so valuable to your fellow students, as well as for your own reflection. What is Wellbeing/Wellness? Being a medical student can be challenging at times and can feel overwhelming, especially as you start your clinical placements. We care greatly about your health and wellbeing and we want to make sure each and every one of you feels supported and able to blossom while you are with us. This chart shows the dimensions to wellness. Each of the dimensions will help you when it comes to your individual wellness. 2) If you find yourself overwhelmed at any point with an issue – ask for help from the Student Welfare & Professionalism Support Team (SWAPS). A problem shared is often a problem halved so talk to your Peer Mentors, family, friends and academic advisers too. 3) Clinical placements are demanding but are truly wonderful, life-changing experiences, so enjoy yourself! You will meet and develop professional relationships and build networks with amazing clinicians, foundation doctors, nurses, support staff and patients who will greatly enrich your life. 4) Get involved. Your health and well-being and those of others is greatly enhanced when you support one another so get involved in peer mentoring, become a wellness champion or join a society to help support your peers. Stay positive by maintaining a healthy attitude: Taking a few minutes to just sit quietly with your thoughts. Suround yourself with nice things. Be thankful at the end of each day, think about what went especially well that day. Try to get up early so you can have morning ‘me’ time. Take time for yourself, by yourself, to get away for at least a few minutes. Don’t take yourself too seriously, laugh more! Current Useful Contacts Please find below a list of handy contacts for you to use throughout your Clinical Education Years. This information is accurate according to our records in May 2019. 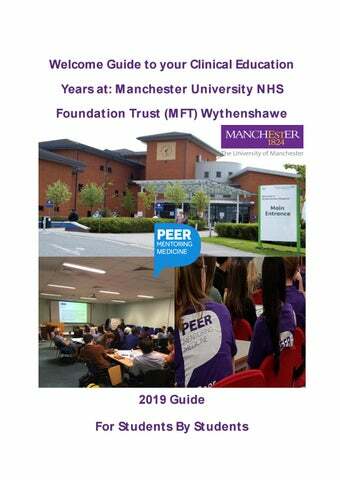 We hope you have found this guide useful and all of us wish you good luck in your clinical education years here at the University of Manchester. A Previous comment from a year 3 student about the guide was: â&#x20AC;&#x153;The survival guides proved really useful for me when I was making the transition to Manchesterâ&#x20AC;?